Val Thorens is compact and purpose-built and is Europe's highest village. Set in a huge ski bowl, with runs fanning out in all directions, providing excellent snow conditions throughout the season. Ski down the valley to Les Menuires and the wonderful La Masse area and then pop over to nearby Courchevel and Meribel on the massive 3 Valleys circuit. This is some of the most amazing skiing in the world. The resort has been cleverly planned, creating a village feel around a compact centre and offering doorstep skiing wherever you stay. Val Thorens also offers on piste Wi-Fi access, offering the unique service at several points on the mountain. Free Wi-Fi connectivity will be available at the Plein Sud, Moraine and 3 Vallée 2 chair lift stations, the Cairn & Caron gondola stations, the Cime Caron and Bouquetin cable car stations and at the Péclet Funitel lift station. Val Thorens is the highest ski resort in Europe, sitting at 2300m. It is a fantastic all round resort with excellent facilities for all abilities and lots of activities and accommodations for all families, group sizes and ages. Foodies will enjoy the vast selection of culinary delights in over 60 restaurants. Sports enthusiasts can experience all extra activities after a day on the slopes including hikes, tobogganing, mountain biking, ice driving and more! Whist après animals can dance into the night at one of the 40 bars across the village. A free shuttle bus runs around Val Thorens village and between les Menuires, Reberty and St Martin de Belleville. The other 3 Valleys resorts can only be reached on skies or snowboard by the ski lifts. The range of slopes in Val Thorens skiing area is amongst the best in the world, with the testing mogul fields of the Cime de Caron and La Masse, further down the valley, and endless off piste opportunities on the Chaviere or Peclet glaciers for advanced adventurers. The virtually inexhaustible range of red and blue pistes provides the intermediate skier with endless opportunities during their Val Thorens skiing holiday. The long sweeping blues such as Genepi, and the more challenging reds, including the long descent down to the Maurienne valley, added to the vast terrain of the rest of the Trois Vallees, more than satisfies even the most mileage-hungry of skiers during their ski holiday. 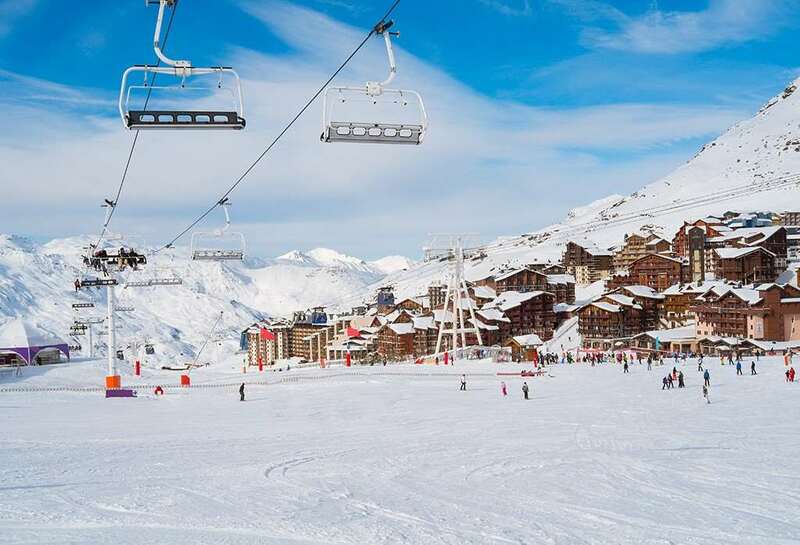 Val Thorens has many runs back to resort, which is where the wide open gentle blue slopes favoured by the novice skiers and boarders are found. There are many artificial snow making facilities across Val Thorens pistes to contribute to natural snowfall for guaranteed skiing throughout the season. As the highest ski resort in France it is one of the most snow-sure with snow from the end of November through until May. 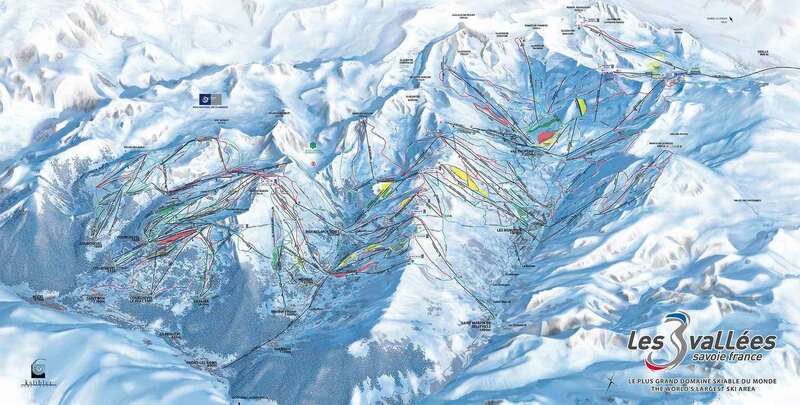 85% of the 3 Valleys ski area is above 1800m with 10 of the 25 summits above 2500m. 2007 snow cannons help guarantee snow coverage. There are lots for families to do on and off the slopes in Val Thorens. The huge 3 Valleys ski area caters extremely well for all ski and snowboard abilities, so there is plenty of slopes to keep the whole family happy. The village is built for quick access on to the slopes so you know that the morning rush on to the slopes and to ski school will be easy. Val Thorens offers lively and varied apres-ski, the popular bars and restaurants close to the centre along with 3 late night clubs. The best bars for apres are Folie Douce, The Frog and Roast Beef and Saloon Bar, with Malaysia club for late night partying. There is a good sports centre which has a swimming pool and squash courts. Evening skidoo rides are popular and highly recommended. For a more relaxing evening, check out the cinema, which has many films in English. With spectacular locations, our vast range of excellent Val Thorens apartments are perfect for groups and families whatever your budget. Our superb selection of Val Thorens hotels will meet any requirement you may have whilst keeping you close to the slopes. Ski chalets in Val Thorens all boast excellent locations within easy access to the slopes. A ski holiday in Val Thorens offers the convenience of having everything you could require from a ski holiday within walking distance, thanks to Val Thorens being a purpose built resort. Take a look at our ski chalets in Val Thorens and make the most of your Val Thorens ski holiday. The nearest airports to Val Thorens ski area are Chambery, Geneva and Lyon which are all within a three hours drive of resort. Great resort situated in the highest region of the Three Valleys. Unique destination voted Europe & the Worlds top ski resort. The village is sun facing and on a clear day the views are breathtaking Plenty of 'extras' to this resort. Try the thrill of the toboggan run, or strap your skis/board to your back and scoot between two mountains on the zip wire. Your adrenalin is certain to receive a severe work out ;) Apres is off the hook in VT. Folle Douche swings into action early afternoon and then ski back to the resort centre to continue the party. At the base of the slopes in the thick of the action you will find a wide range of bars and restaurants and to finish the night off the famous night club 'Malaysia', the largest nightclub in the Alps, welcomes you to its underground home. Let the beats begin ... VT = top slopes, top fun factor, top of the mountain snow excellence. Just returned from our 6th trip to Val Tho. Brilliant for a mixed group of skiers such as ours, including absolute beginners and black run skiers and boarders. The huge ski area of the Three Valleys means that after 6 years there are still just a few runs we haven't skied, and even on busy days the area can cope with lots of people. Height means that we have never had poor snow - even at Easter. Views from the top of the higher lifts are breathtaking! True, being above the tree line and purpose built in concrete, the village is not picturesque in anyway, and exists solely for the skiing. On the plus side this means that it conveniently provides all necessities. The nursery slope goes through the center of town with several hotels' boot rooms fronting on to it (we stay at the Val Chaviere - 2 steps from ski room to slope), this is a huge boon for those of us with some who ski all day and some who don't. A good range of medium quality restaurants, few really excellent. The nightlife is plentiful and good for our party of teenage and twentysomething children, and sports fans, but those on the look out for a quiet bar may have to stay in the hotel or search hard for the few that don't turn into party venues after hours. (John's Scandi is a favourite place for a good meal or a glass of wine). We've only once had the energy post skiing to go down the toboggan run but it was much enjoyed. We occasionally go to the bowling alley to spend collected Euro coins with the younger ones on arcade games and pool tables, and the gauffre (waffle) stall is a must every visit. A resort for those who going skiing to ski rather than to pose - not much room here for your furs!